Well this was certainly a fun (and challenging) film to work on! 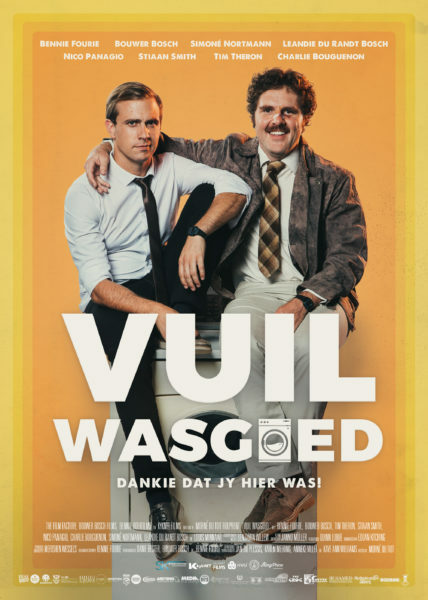 Produced by The Film Factory in association with kykNet, Vuil Wasgoed tells the story of two friends, Wim and Kevin, who work at a laundromat. By day, things are boring, but when the sun sets they party in their clients’ clothes. During a party, they discover a chopped-off finger in a client’s suit jacket. The underhanded owner of the finger, his sons and a ruthless traitor is hot on Wim and Kevin’s heels and will do anything to get back what's theirs. Action-comedy is probably one of the most difficult genres to tackle as a filmmaker. Both action and comedy genres require precise timing and pace and combined into one genre, it can be very daunting to tackle. The script, written by Bennie Fourie was brilliant, both in story and humour and because the script was so incredibly tight, it made the editing process, specifically, a great deal easier. It also meant that we could focus more on the pace and flow of the story rather than spending time on structural issues, because the structure in the script was meticulously laid out. Morné du Toit's directing really brought the story and characters to life. One of the many things that I've learnt is that planning in pre-production, especially for a film like this, really pays off throughout the creative process. We had the rare opportunity to sit in pre-production with the incredibly talented storyboard artist, Israel Holtzhausen, from Fathom Media. Morné, Eduan Kitching (DOP) and I sat together and planned out shots that Israel sketched out as we came up with them. The storyboard was key in not only executing the shots on set but the sequence of shots planned was also implemented in the edit. I could sit with the storyboards in the edit room and follow the sequence and because Morné had invited me to be part of the process from the beginning, it all made perfect sense. Between Eduan and Morné they also translated the boards into moving images incredibly accurately. What really made the difference for me was taking a break from the sequence for a while and then revisiting it much later. When I returned to the sequence with fresh eyes, it became glaringly obvious which shots were holding too long and which shots were totally unnecessary. You also fall in love with certain shots because you've been watching them over and over again, each time seeing something new and interesting. Problem is, for an audience who may only watch the film once, they're not going to see what you've been seeing over the course of two months. They're just going to wonder why the film is dragging. Our data wrangler on set, Theo Scheepers, did a fantastic job wrangling the footage every day, making backups and checking footage. However, he also labelled, synced, binned and transcoded all of the footage in Adobe Premiere Pro which saved me a massive amount of time. There's more... For every shot, he would enter all the relevant metadata from the continuity sheets. Footage was recorded with an audio guide track from camera which allowed him to use Adobe Premiere Pro's auto sync feature. Amazingly he was able to do this with just a MacBook Pro on set. The man is a DIT machine! Cutting during principle filming is becoming a standard. There are just too many benefits not to do it. I was usually one day behind filming as I would only receive my project files (via Dropbox) and transcodes the following day. As the majority of the shoot was in and around Johannesburg, getting footage to and from set wasn't an issue. As mentioned, I edited in Premiere Pro which gets better and better with each update. I've become really comfortable with PP and it was incredibly stable. There are one or two things that I wish Adobe would have a look at, like faster zooming in and out of a timeline, but in general it performed well, especially given the amount of assets in the project. 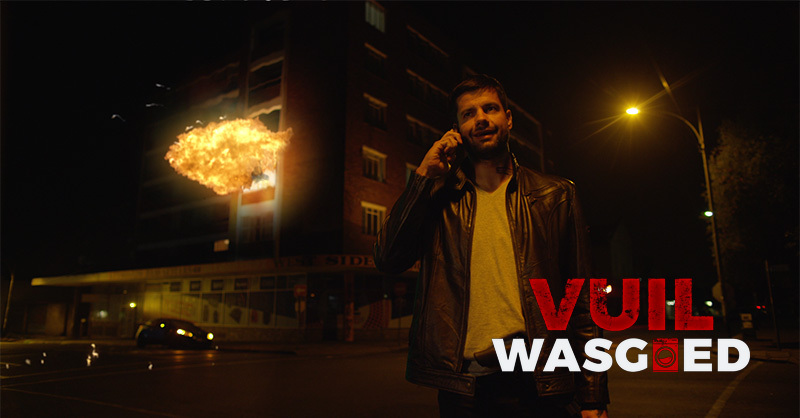 There were a total of 89 VFX shots, ranging from muzzle flashes and cell phone comps to building explosions. The integration between Premiere Pro and After Effects was a major advantage as I could start working on rough comps to give Morné an idea of the visual effect while cutting and then, when I needed to complete the shot, I could open that original project and continue refining and finishing. Once the shot was completed it automatically updated in Premiere Pro and we could view the film on the timeline without having to render and import. Eduan Kitching was also responsible for the online and grade of the film. We wanted to establish a workflow for the VFX shots that didn't require him to grade all the VFX shots first, render them out and send them through to me. 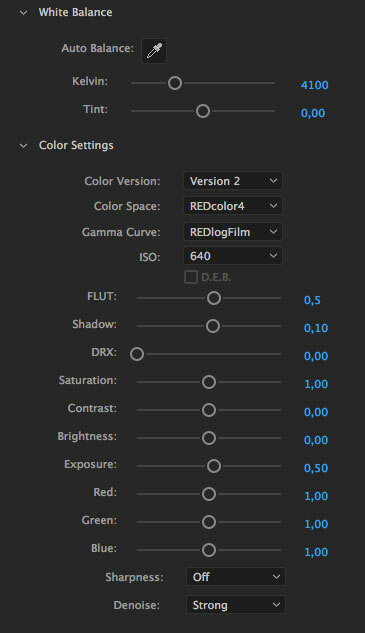 Instead, once he had finished grading the shots, he would send me the LUT file, which I placed as an effect on the RAW shot in After Effects as well as the main RED settings. This ended up being a great workflow as any changes on his side, I could implement just by changing the settings on my side, without the need to re-render and deliver files. Vuil Wasgoed premiered at this year's Kyknet Silwerskerm film festival in Camp's Bay. After months of work the team could sit back and enjoy the film in a packed theatre. This is also the most nerve wracking part of the process - is the audience going to react to the film, laugh in the right places and be generally entertained? Well, the audiences' response to the film was probably the best reward for the work that the team had put in. There was laughter from beginning to end and all the feedback that we received was overwhelmingly positive. For his incredibly hard work, Morné took the award for best director, Benjamin Willem for Best Score and Janno Müller for Best Sound Design. I was also awarded Best Editor, truly humbling considering that some of the best editors in the business were also nominated. Bennie Fourie won for Best Actor and Merishen Wessels won for her outstanding work on Production Design. This film is a must see for all audiences. It was a blast to make and I guarantee it will be just as much fun to watch. Vuil Wasgoed releases country wide on the 8th of December 2017.